Thanksgiving and many other holidays can be very meat-centric, but it doesn’t have to be! I have been making this Tofu Stuffing Casserole for 10 years now and I bring it to every Thanksgiving, Friendsgiving, and Holiday party. It is always well-received and devoured by family and friends. It’s a great source of protein and has soooo much flavor! It also looks super appetizing in a glass casserole dish since you can see all of its layers. Thanksgiving and many other holidays can be very meat-centric, but they don’t have to be! 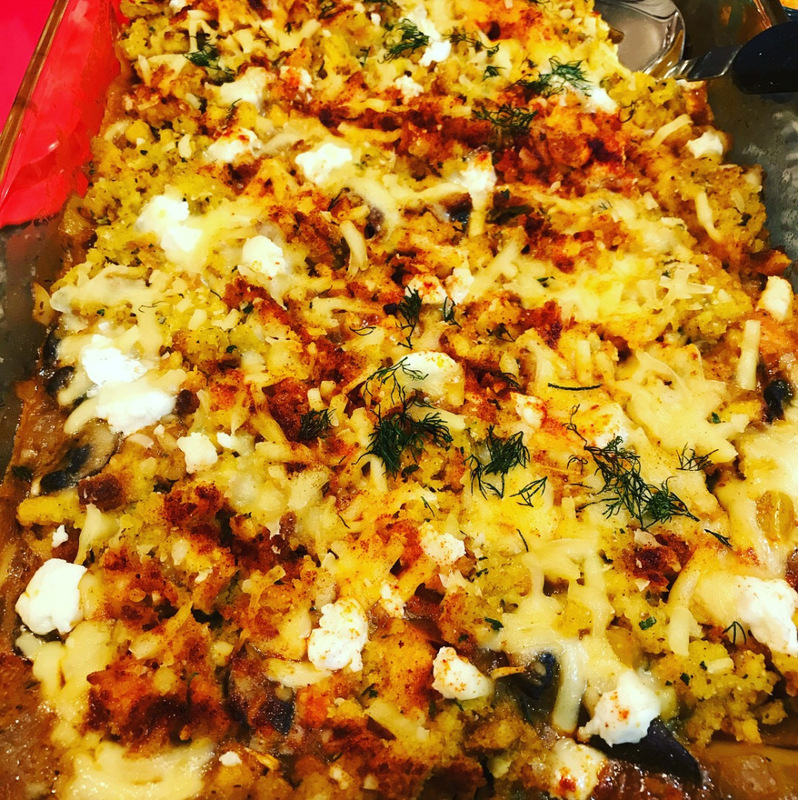 I have been making this Tofu Stuffing Casserole for 10 years now and I bring it to every Thanksgiving, Friendsgiving, and Holiday party. It is always well-received and devoured by family and friends. It’s a great source of protein and has soooo much flavor! Prepare the stuffing per the directions on the box. Drain the tofu for at least 1 hour before. Preheat the oven to 350 degrees. While the tofu is draining, chop the vegetables so they are ready to be sautéed later! Once the tofu is properly drained, turn the stove on and use medium heat. Pour the olive oil in the pan, heat up the oil, and add in a small piece of tofu. When the tofu is sizzling, add in the tofu, pan fry for about 3-4 minutes on each side, at the end of the sautéing process, sprinkle the hot sauce, then stir, then add in the buffalo sauce, and stir. Sauté until the tofu is crispy and golden brown. For the sauce, add the olive oil to a separate pan on medium heat. Add in a small piece of the onion. Once the onion piece is sizzling, you can add in the rest of the onions on medium heat and when they’re golden brown you can add in the peppers and mushrooms. Stir fry the vegetables for about 3-4 minutes making sure that everything is golden brown. Add in the garlic and dill, sauté for about 1 minute, then add all of the spices. Pour in the Tamari/soy sauce, white wine vinegar, and dijon mustard, stir till it creates a paste. Then add in the vegetable stock, once everything is boiling, whisk the almond milk and flour to thicken the sauce. Stir the almond milk and flour and turn the heat on very low for about 15-20 minutes to simmer until the sauce is properly thickened. Taste the sauce, make sure it is flavorful, add in the green onions, and turn off the heat. In an oven-proof casserole dish, pour in the tofu, spread it around the casserole dish so it covers the entire bottom of the dish. Then add the sauce and stir it with the tofu so it is evenly distributed. Then add the stuffing on top of the sauce and tofu, distribute evenly so it is covering the sauce and tofu. Sprinkle the cheese on top evenly distributing it and sprinkle some smoked paprika on top. Bake for 25-30 minutes until the cheese is golden and sizzling. For the sauce, add the olive oil to a separate pan on medium heat. Add in a small piece of the onion, once the onion piece is sizzling, you can add in the rest of the onions on medium heat and when they’re golden brown you can add in the peppers and mushrooms. Stir fry the vegetables for about 3-4 minutes making sure that everything is golden brown. Add in the garlic and dill, sauté for about 1 minute, then add all of the spices. Pour in the Tamari/soy sauce, white wine vinegar, and dijon mustard, stir till it creates a paste. Then add in the vegetable stock, once everything is boiling, whisk the almond milk and flour to thicken the sauce. Stir the almond milk and flour and turn the heat on very low for about 15-20 minutes to simmer. I made this last week and really loved it! Stuffing is my favorite part of a Thanksgiving meal, and this is no exception. To compare this to boxed stuffing would be an insult to existence itself.